"An innovative, squeezable mascara which allows you to continuously regulate the amount of mascara product on the brush. The built-in wiper sleeve at the mouth of the mascara tube is easily manipulated....Squeeze as you pull the brush through - take off excess and keep what you want to! Now your brush can be both an applicator and a lash separatoer. Stop scraping it off or wiping with a tissue. Just squeeze. Its that simple!" Lash Control is the newest innovative mascara that I've seen. You simply squeeze the tube to get the amount of mascara you want or need. I love the concept. So based on the color, there are many different Lash control Mascara types, and many more to come! So not only are the bottles are cute, this mascara really does work. I like the idea that if I'm going out at night and I feel like wearing extra mascara, all I have to do is squeeze a little bit more then usual, and I get a more thicker, longer lash. The Pink Squeeze was my favorite choice of mascaras. It lengthens and conditions your eyelashes. I've always been a length kinda gal when it comes to my lashes, so I automatically wanted to try this one. Not squeezing the bottle at all gives you a nice length and a little volume. When I squeeze the bottle more, I got very long black eye lashes! And no, it doesn't make a mess or get all over your hands. It's very neat and in such a cute tube! And the clear squeeze is meant to touch up your lashes after you have applied the mascara. It just adds that finishing touch for shine and length. I really think using all 3 of them together gives you more of a "look", but of course they can all be used on their own. Mix and match, use 2, use 3, either way you will have fabulous eyelashes with Lash Control. Jennifer from Lash Control from Clumps of Mascara on Vimeo. So the end result? 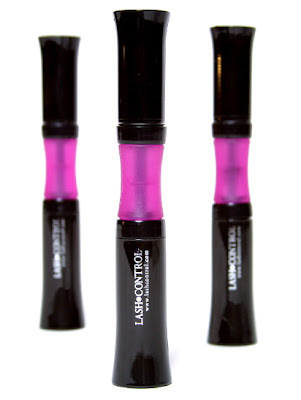 This is an amazing mascara, but I have to say my favorite part is the tube you can squeeze. The idea of being able to control how much mascara you use with one little squeeze is awesome, and I can't believe it hasn't been thought of sooner!! You can purchase Lash Control on their site, or check out any of their retail stores. To enter, visit Lash Control and tell me why you want to try this, or what your biggest eyelash concerns are!!! - New! for 5 extra entries "Like me on Facebook"
That's it my beauties! Good luck!! Giveaway will end 8/22. Winner will have 48 hours to respond to the winning email or another winner will be chosen. No Po Boxes Please. Open to the US only. Disclosure: I received product for the purpose of this review only. All opinions are my own. I want this! Because I have been looking for a new mascara to try, I can't find the right one! I "Like" Lash Control on Facebook! I would love to try this! I like to go a bit lighter during the day than for an evening out. I love that you can fully control the application! My biggest concern is I have very fine short eyelashes and would love to try this out and see if it helps me. In the past I have spent upwards of $145 for a tube of Lashfactor MD and it only works as long as you use it every day. That gets kinda expensive so had to stop. Would love to try these! "Liked" Lash Control on Facebook and left comment saying you had sent me. I hate clumpy mascara - this one looks awesome! Thanks for the chance to win! I really want this because it seems like every mascara I use makes my lashes clumpy! I like Lash Control on Facebook and told them that Bella's Beauty Spot sent me! I love mascara and I don't leave home without it on! I have very big cow eyes and short stubby lashes!! I love that these mascaras lengthen. "Like" Lash Control On Facebook and posted that you sent me!! My biggest eyelash concern is they are brittle and break, so I use mascara rarely although I would love to give this a try. My biggest concern is finding my eyelashes-I know they are there somewhere but where? Age does weird things to women. I would love to try this, because I feel like I waste so much mascara wiping it off on tissue. I want this because I don't wear much makeup, but whenever I have a special occasion or am having my photo taken, mascara is a must. My biggest concern for my lashes is getting them to grow LONG!! Thanks for the chance! I follow your blog already via gfc! My biggest problem with my Eyelashes Is making them look lumpy and unnatural...so many mascara's do this to me! I'd like this to lengthen my lashes. I would love this to be able to lengthen my lashes!!! It's hard to find a good mascara that actually lengthens! I want to try this because I'm always looking for good lash products. My lashes are blonde and without mascara I look like I have lizard eyes, so, finding a mascara to lengthen and that stays on is very important. I would love to try this because I hate getting too much mascara on the wand when I'm going for a more natural look. My eyelashes are very short. This would be ever so helpful! I follow your blog, and it's my favorite blog on the web. I need this because I have thin eyelashes. my biggest eyelash concern is short,skimpy lashes. I can never find mascara that doesn't make my eyes feel weighed down! I would love to try this. My main concern with my eyelashes is that any mascara I use seems to make them lump together. My lashes are pathetically short & thin, so I am always on the lookout for a great mascara. These sound very cool & effective. I "Like" Lash Control On Facebook told them Bella's Beauty Spot sent me #1. I "Like" Lash Control On Facebook told them Bella's Beauty Spot sent me #2. I want to try this because mascara is the only makeup I will not leave the house without. I always worry about clumps, I hate looking like I have four giant lashes! my biggest eyelash concerns are color and volume! I want to try this because I always seem to have to put multiple layers of mascara on - with the squeeze tube I could get enough in one swipe. I would love to try this as cannot seem to find the "right" mascara.....they always seem to dry out or something? mascara is one of the hardest makeups for me to apply. I have never found one I am completely satisfied with. I always have issues with clumping. Would like to try this. My eyelashes don't stand out and would like them to!! I'd love to try this, because I have very short and straight eyelashes! Hopefully this will make my curl stay and give me the effects of longer lashes. My biggest eyelash concern is that my eyelashes always seem to clump whenever I put mascara on! I would like to win this, because it looks like a cool product and one of my biggest lash concerns is losing my lashes. I want to try this because it is such a unique and interesting idea that I just have to try out! My biggest eyelash concerns are definitely length! I'm concerned that my lashes aren't as full as they used to be. I often skipped mascara due to time and the mess it can make. However, I'm noticing a lot more compliments when I use it vs when I skip it.